My L320 came with a hideous step bumper which I immediately removed. I would like to replace it with the small bumperettes but I see they are pretty hard to come by. They look as though they would be fairly easy to fabricate (my buddy is a master metalworker on hot rods and choppers) but I need some dimensions. I could guess based upon pictures from the web but I would like to get them as close as possible to the original dimensions. I will probably paint them rather than getting them chromed. If anyone has a set (really only one since I believe L and R are identical) and can take some measurements, or even take some pics from all sides with a ruler strategically positioned in the picture for reference it would be a big help. (Plus the thickness of the metal would be good to know.) Thanks in advance for any help! It would be easier to use 520/521 bumperettes, the 320 versions are smaller and are made of pretty thick metal, no way a home owner could make a set of them unless there was a piece of metal tube around 3 inches round with a domed closed end on it, that could be cut in half and made into a bumperette that looks similar to a 320 bumperette. These are 320 bumperettes below. Make em thinner then. But a home built forge would soften up that gauge if one was determined. But no need to make them perfectly to factory scale. They will never be factory. Just make them identical. 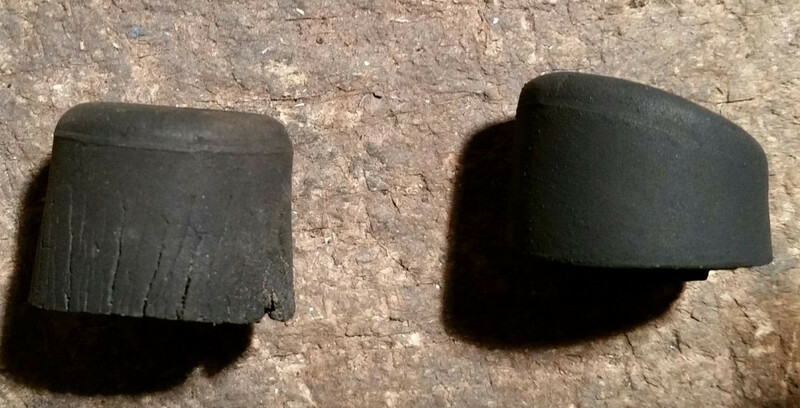 OK, so they are actually 3 1/2 inches and the front is slightly flattened, but maybe an exhaust shop could bend two 3 1/2 inch exhaust pipes the proper shape and then the backs could be cut off to resemble bumperettes. Crashtd420 yours came out looking great, nice work! I like how they're tucked in just under the tail lights. They look like they belong there. 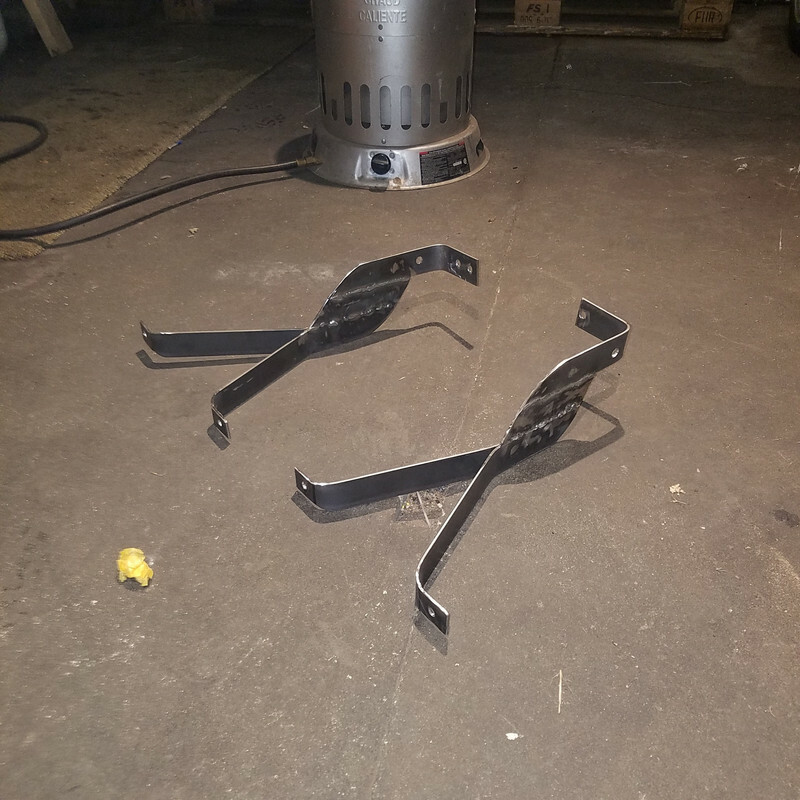 Thanks for posting pics of your brackets as I will have to fabricate them whichever way I end up going. It looks like the bumpers have gone up in price a bit since you got yours, now listed for about $125 including shipping from Thailand. I may rethink the idea of making them, although I can buy a hollow steel sphere of the approximate diameter and slice out a quadrant to form the closed end, and thought of using exhaust pipe with a 90° bend on one end, split down the middle with a quadrant welded on the end to complete the look. My friend is an extraordinary metal worker and he loves a challenge so I would only be out the cost of materials if I go that route. Now if I only knew how long the stock 320 bumpers were... I'm guessing about 18" OAL? OK, so they are actually 3 1/4 inches across the back the full length, not 3 1/2 inches, and measured from the end of the outside curve to the other end is 16 inches, you can see both ends in the photos of my previous post, end to end is 16 inches. I have a couple sets of the cheap Thailand type that I can let go for less than listed, but they are different and are made for the 520/521, the 320 bumperettes are a style all there own. If you have to completely make them try to use something like a small c channel piece of steel, you want to use something that doesn't flex side to side... I actually had to add some bracing to the spine of my brackets so they wouldn't wag and vibrate .. I will definitely use some kind of flanged strap material so it has stiffness in more than one direction and if the old brackets can be modified that would be a headstart. Thanks for the suggestion. 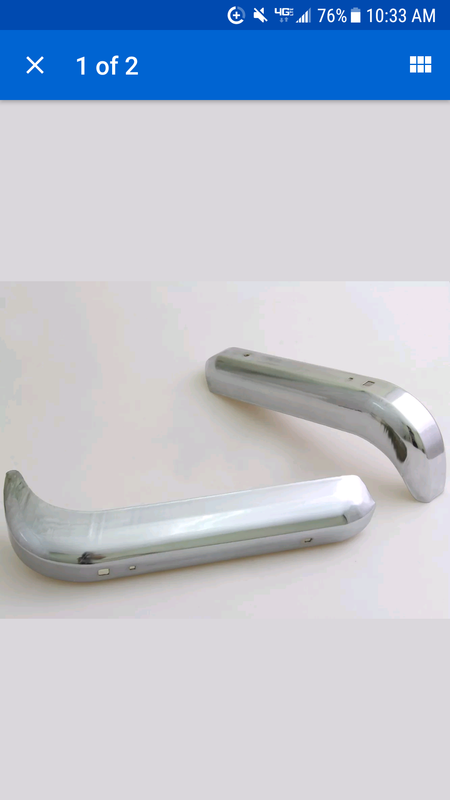 They ARE bumpers, intended to save tail light and rear body damage even to the point of sacrificing themselves. So use something substantial to transmit force to the frame. A cut down and modified bumper from a Sunbeam Alpine would look nearly identical to the OEMs. You can get originals for about $250 each (front and rear). MGB early chrome front bumper looks like it would do the trick as well, and they are much cheaper to buy new or used. 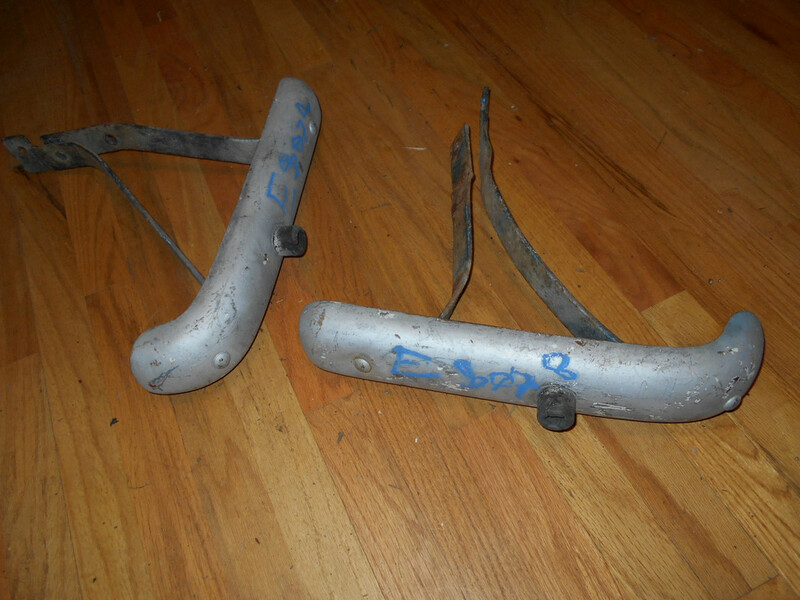 I have an extra set of 320 rear bumpers that I would sell for $200 plus shipping. 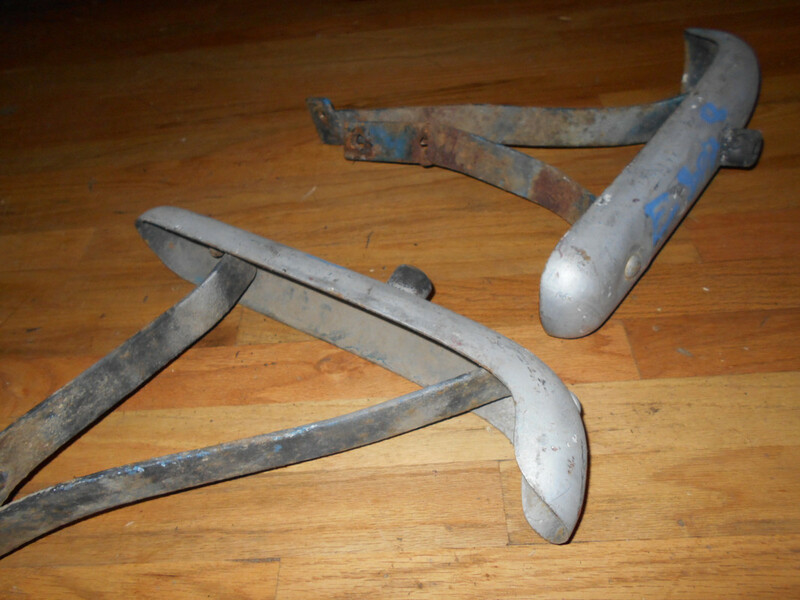 Have some rust on them but no dents, and you would still have to make the mounts. But they are the correct 320 ones. Even the 220s are different by being smaller. Thanks for the offer but my buddy already started fabricating them. Maybe someone else here is in need though. I'm sending mine off to chrome soon and I'm wondering if anyone's found good replacement rubber bumpers? I was going to go to the Parkrose hardware store near me and see if they had something, when I was there last they had quite a selection but I didn't have mine with me as I was there about trim mount hardware which they did not have. I actually have my old set, but I cannot say that these are what came on the truck when new. Can anyone get a measurement on the stuck bumpers? 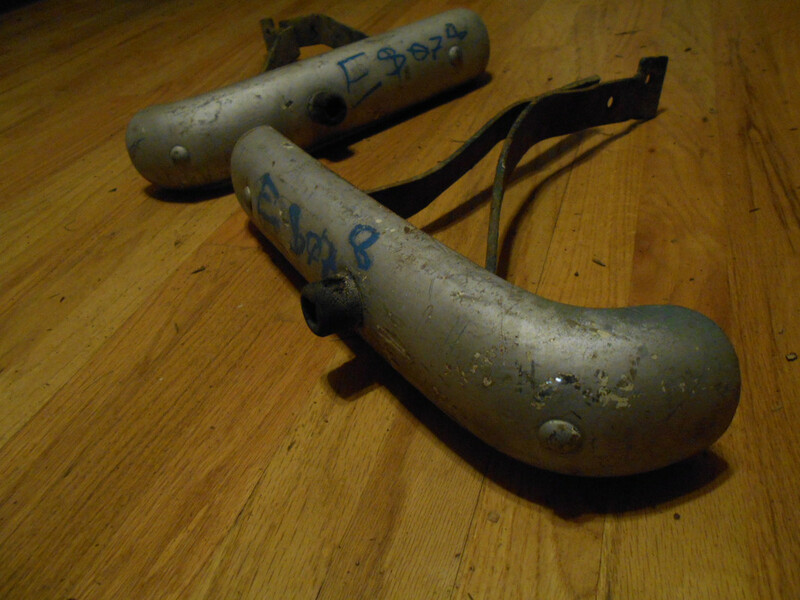 I found these are are: Height: 27/32", Base Dia. 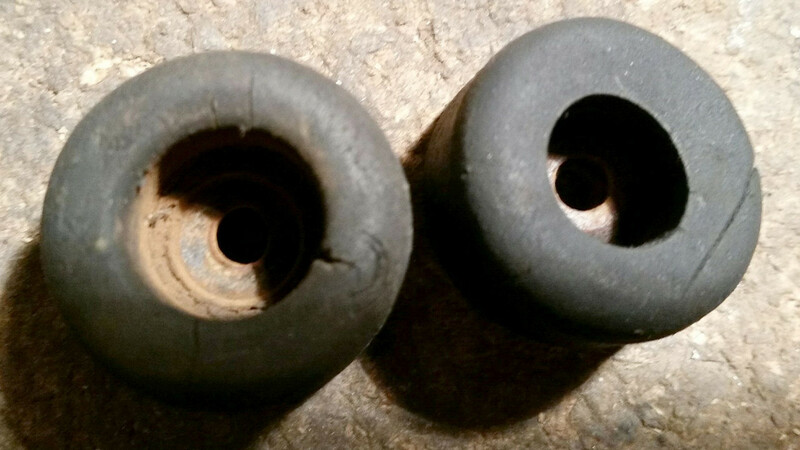 : 1-1/16"
The ones I have measure out at around 1 inch high measured from the base to the top like the bumper in your link(one measures out at 15/16ths inches), the base is 1 3/16ths and the top is about the same, the hole in the center is around 5/8 inches across and about a 1/2 inch deep. The base is actually a little curved but that may be because of it mounted on a slightly curved bumperette. These measurements are of the old cracked ones in the photo I posted, they are beat up, I am going to the hardware store fairly soon and will post my results. There was nothing at the hardware store even close, I went to the Autozone in the same lot and he suggested the hardware store and when I said I had been there he asked if I talked to someone that knew the place, he had a hard time believing they didn't have it also. So I went onto ebay and searched (1" rubber bumper black) and bought this below, when they get here I will see how close they are. I tried searching 1 1/16th and 1 1/8th but nothing showed up in the results. 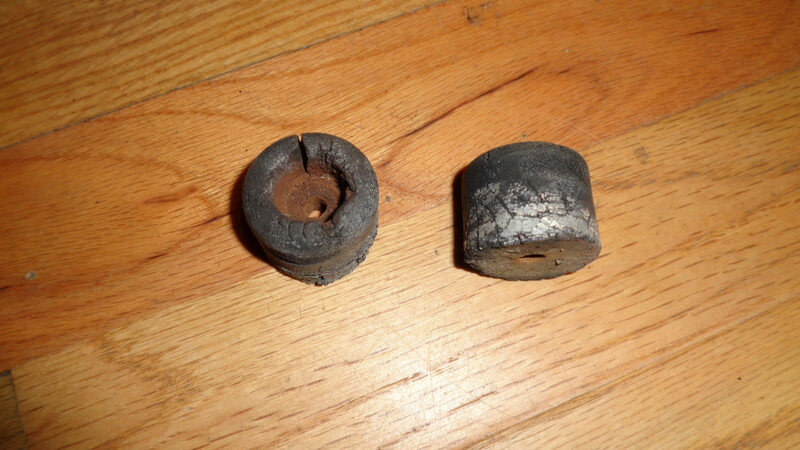 Here are a couple pictures of rubber bumps. The left one is off a L320 and I believe the angled one is for the 520. I took mine off and put some chrome plugs in the holes. I know they serve a purpose, but I think they are distracting. I rarely move my tailgate to the fully down position, just to the straight out position held by the chains. Great thanks! 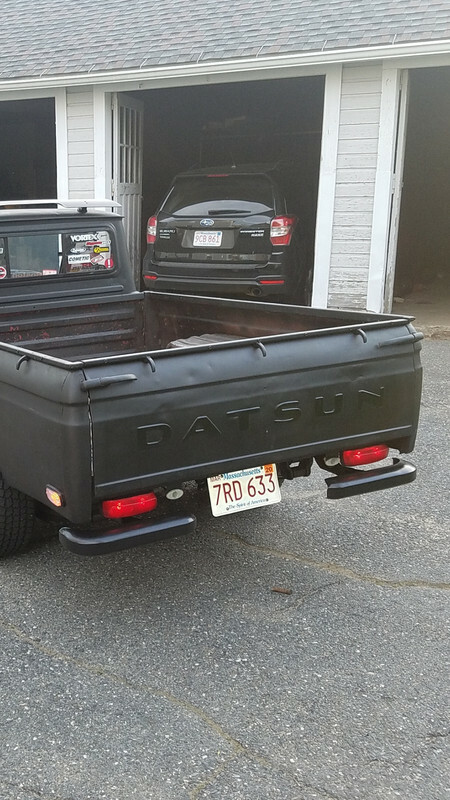 Can you get a good measurement on the 320 bumpers? I measured two of them. Base 1 1/4", Top 1 1/8", Height 7/8". 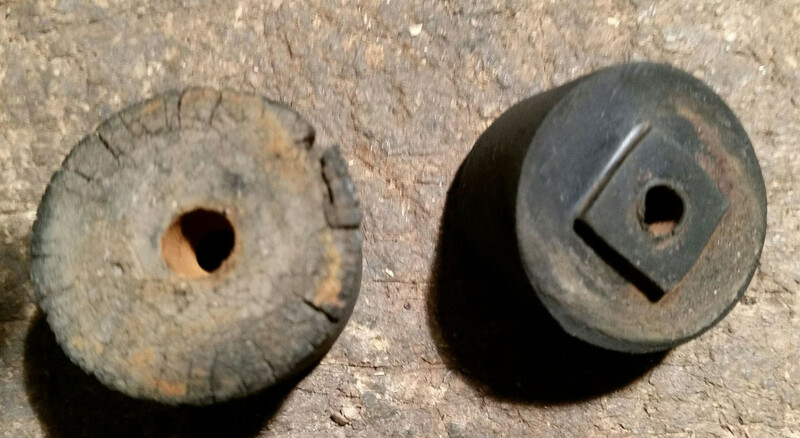 Through hole 1/4" dia., Upper hole 5/8" dia. I ordered the "Bumper, Rubber, Black, 1"H x 1"W, PK.10 ZORO SELECT 719R-034S" from that Zorotools place, but they sent me the 3/4" AP#719R-017 instead, I have sent a message to them and am waiting for reply, at this time I would not buy anything else from them unless they make it right, it was only $10.00 but it's not right.